Now you can get even more from booking with us. With IHG®Business Rewards, you can earn points every time you book accommodation, meetings, or an event at over 5,000 participating IHG® hotels worldwide. From board meetings and conferences to weddings and social events, we understand the work that goes into planning and we think all your bookings are important, so we reward you no matter the size. From hotel stays, to air miles, to gift cards, with IHG® Business Rewards, the rewards keep getting better – and stacking up! Whether it’s personal rewards or company rewards, the choice is yours. 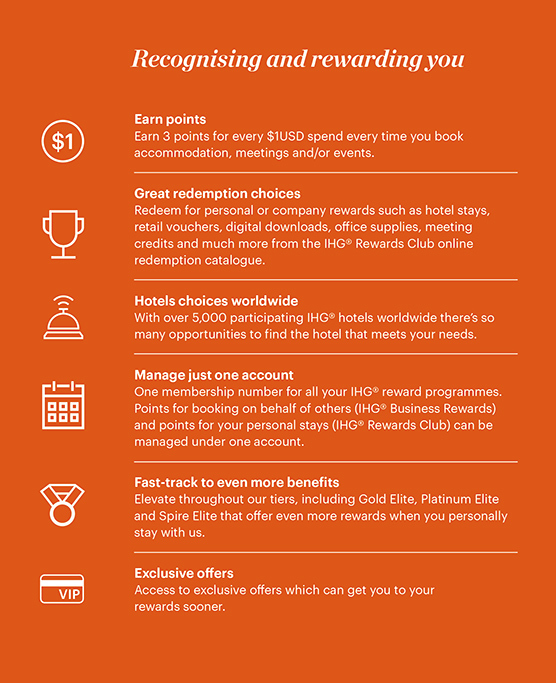 With IHG® Business Rewards, you automatically earn 3 IHG® Rewards Club points per US $1 every time you book qualified accommodation, meetings or an event. Now, thanks to the Booker Bonus promotion, you’ll earn DOUBLE IHG® Rewards Club points instead – that’s 6 IHG® Rewards Club points per US $1 spent. What could your points get you? competitions, destination tips and more. This hotel is owned by Colwall Property Investment LTD, and operated by InterContinental Hotels Group. © 2018 Crowne Plaza AUCKLAND. All Rights Reserved. Tell us about your event and what you want to know more about at our Wedding Showcase.